Enga is one of the provinces in Papua New Guinea (PNG). It is located in the north most region of the highlands of PNG, having been divided from the Western Highlands to become a separate province when the provinces were created at the time of independence in 1975. The people of Enga are called Engans—they are a majority ethnic group—speaking one language in all its five districts: approximately 500,000 people. 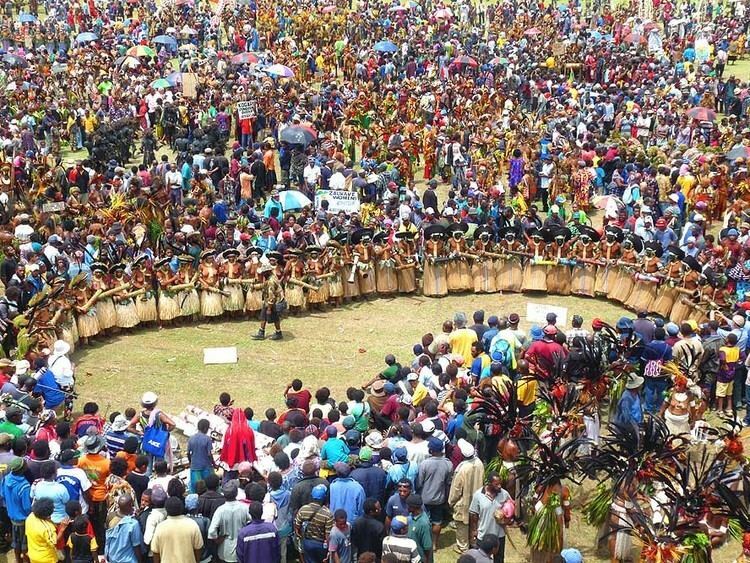 A small minority of Engans land on the eastern side of the region remained in the Western Highlands, their territory being accessible by road from Mount Hagen but not directly from elsewhere in Enga territory. The Papua New Guinea census of 2000 lists the population of Enga at 295,031 people, although the accuracy of the census is questionable. The provincial capital of Enga is Wabag. The two other main centres of population are Wapenamanda and Laiagam. Porgera, at the western edge of the province, is home to a gold mine operated by Barrick Gold. 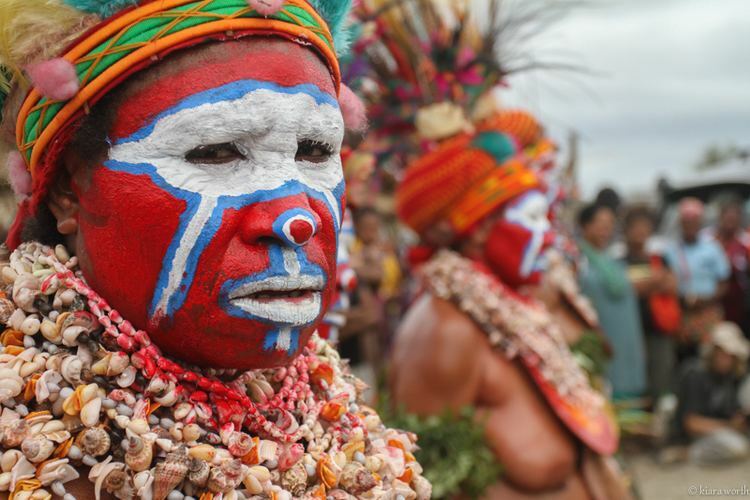 Enga is unique among the provinces in Papua New Guinea in that it has only one major linguistic and ethnic group: Enga speakers. Although dialects of the Enga language vary greatly from Laiagam in the west to Wapenamanda in the east, Engans shared ethnic identity overshadows the existence of other ethnic groups in the province, such as Ipili speakers (around Porgera) and Nete speakers. Like many other highland Papua New Guineans living west of the Daulo Pass (between Simbu Province and Eastern Highlands Province), the traditional Engan settlement style is that of scattered homesteads dispersed throughout the landscape. Historically sweet potato was the staple food, sometimes supplemented by pork. The modern diet places an increasing emphasis on store bought rice and tinned fish and meat. Pigs remain a culturally valued item with elaborate systems of pig exchange also known as "tee" that mark social life in the province. Traditional Engan culture practiced strict segregation of sexes. During initiation young men between the ages of 16 and 19 were purified in seclusion at a ceremony called the "sangai," in which their eyes were ritually washed with water, to remove any taint resulting from contact with females, and where they prepared traditional finery, the most notable item being a wig made out of their own hair. This distinctive round wig topped with sicklebird feathers is, more than any other item, an icon or symbol of Engan culture today. Today the most popular religions in Enga are Catholicism, the Lutheran Church (Missouri Synod) (the Papua New Guinea Missouri Synod Lutherans being confined to Enga and styling themselves the Gutnius Lutheran Church Inc, formerly the Wabag Lutheran Church), the Baptist Church and the Seventh-day Adventist Church. Charismatic and pentecostal movements are growing in popularity. The lifestyle and customs of the Enga people were extensively studied and reported upon by the American anthropologist Mervyn Meggitt. Kompiam is another District located on the Northern edge of Enga Province as Maramuni, a sub-District of Wabag District situated a head of Kompiam sharing border with East Sepik Province. Both Kompiam and Maramuni do share the Physical geography, human geography and culture with the entire Enga Province. Although little archaeological excavation has been done in Enga, it is clear that the area has been settled for over 12,000 years. Europeans—typically Australian gold prospectors—originally entered what is now Enga province from the east in the late 1920s, although the best-known exploration of Enga took place during the early 1930s when Mick Leahy and a party of men travelled from what later became Mount Hagen to the site of the future Wabag and then south through the Ambum Valley to what later became East Sepik. By World War II Enga had been very roughly mapped by the government; Missouri Synod Lutheran and Roman Catholic missionaries were permitted to establish stations beginning in 1949 but a permanent government presence was not established in most of the district until the late 1950s. Both established primary schools and the Lutherans a high school. Officially the Lutheran church in Enga Province is linked to the extremely fundamentalist US Lutheran Church–Missouri Synod but it closely associates with the more mainstream Evangelical Lutheran Church of Papua New Guinea, sharing clerical training at a college in Lae, Morobe Province. 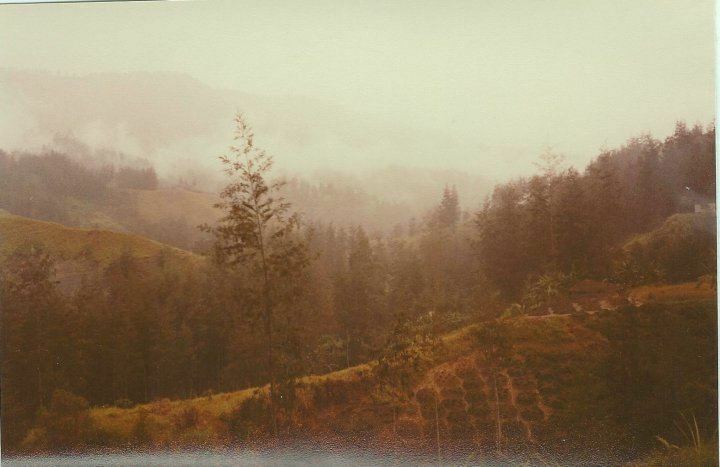 Enga was part of Western Highlands District until just before Papua New Guinea independence in 1975, when most of the Enga-speaking part of the District (with the notable exclusion of the Baiyer River region which is inaccessible by road other than from Mount Hagen) was separated into a discrete District. Eminent international poet and writer E. A. Markham worked and lived in Wabag as a VSO volunteer in 1983-84 and wrote A Papua New Guinea Sojourn about the province and his time in it. The provincial government has a history of corruption and lack of capacity, and is unique in Papua New Guinea for having had its power suspended three times by the national government due to concerns over its accountability. Nationally eminent Engans have included late Malipu Balakau, Sir Tei Abal, Sam Abal, Don Polye, Sir Pato Kakaraya and many others.